Lately, I’ve been seeing Pomelo everywhere. From the local grocery store that sells crappy produce, to Whole Foods (where it is touted as a cleaning product, who knew? ), to the Uruguayan cafe with its bevy of sweets. Aromatic, walking by a stack of them you can tell they are a distant cousin of the grapefruit–in fact they may be grapefruit’s mother (botanists believe that grapefruit is actually the result of the hybridization of a pomelo and an orange). Native to South and Southeast Asia, the Pomelo is huge, clocking in at 2-4 pounds per fruit and while it tastes much like a grapefruit it is a milder, sweeter version of its daughter. Despite its reputation as the sweeter half, I still find the Pomelo bitter–probably because I have little tolerance for grapefruit (even though I am trying to learn to love the citrus). I wanted to find a way to use the fruit, it provides a lot of bang for its buck given the size and the scent is deceptively inviting. The fruit is meaty, with large fleshy segments, which immediately made me think of a curry or stew–this is the resulting dish. The bitterness of the Pomelo is balanced out by the baseness of the coconut and the brightness of the lime; even my grapefruit adverse self gobbled up this stew. An added bonus? One bowl serves up all of the vitamin C you need in a day, thanks to the Pomelo, which is packed with the stuff. This is a super fast meal to prepare, the most time intensive component is chopping the vegetables and peeling the Pomelo. For the Stew: Heat the oil in a medium saucepan over medium heat. Add the fennel and lime juice and cook until the fennel has browned, about 7 minutes. Add the coconut milk and vegetable broth and bring to a simmer. Reduce the heat to low and add the pomelo, red curry paste and sugar until well combined and cook for 3 minutes. Divide the cucumbers among three bowls. Spooning the soup over the cucumbers, divide it evenly among the three bowls. Garnish each bowl with fennel fronds and chili powder or Nanami Togarashi to taste. 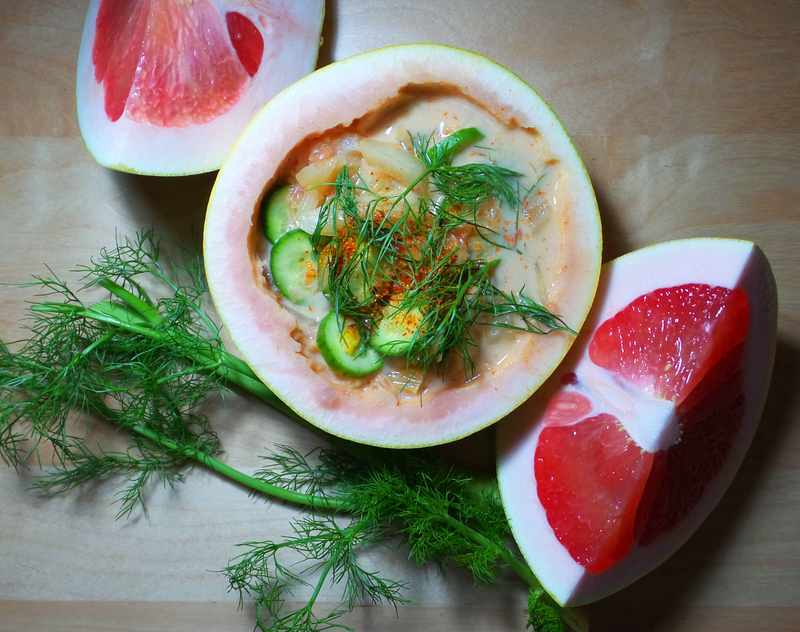 This entry was posted in Mains, Soup and tagged fennel, gluten-free, mini cucumber, pomelo, soy-free, stew, vegan, vegetarian. Bookmark the permalink.